There is no doubt about this issue that literary pursuit is the only identity of Sarat Chandra's life. 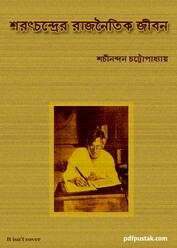 Sarat Chandra was a literary-emperor, was an unbeaten words artist. Literature was the essence of his life, this statement is as true likewise if we exclude the essence of his political life, his biography will be incomplete. Long fifteen years in the end of his life he was associated with the political movement of Bangla. Collect the book and know more about the subject.